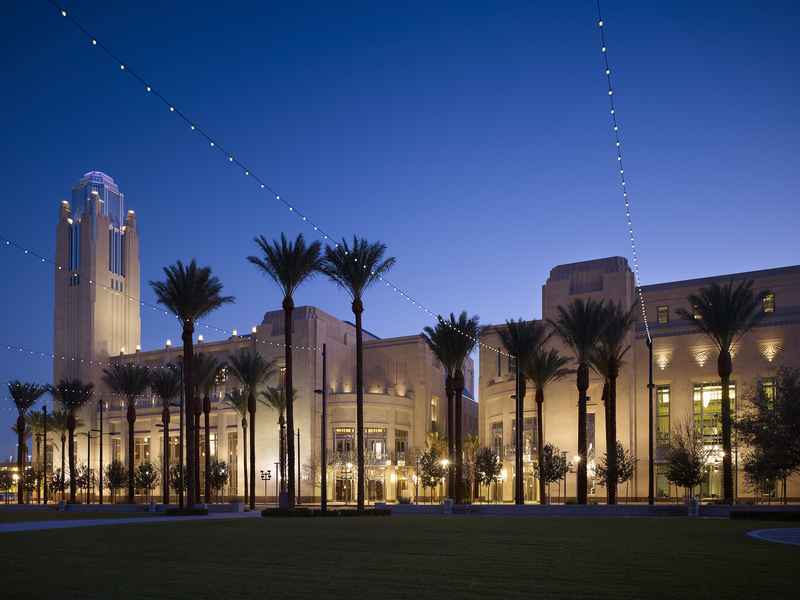 Washington, D.C. – David M. Schwarz Architects (DMSAS) announces the completion of The Smith Center for the Performing Arts, the much-anticipated cultural centerpiece for Las Vegas. Upon its completion this winter, The Smith Center, inspired in part by the iconic design of the Hoover Dam, will join a luminous DMSAS portfolio of acclaimed cultural and civic cornerstones that includes Schermerhorn Symphony Center in Nashville and the Nancy Lee and Perry R. Bass Performance Hall in Fort Worth, Texas. “Much of Las Vegas is conceived and designed as an escape from somewhere else. The Smith Center is conceived to express the aspirations of the Las Vegas community, a place where people live and work,” said Gregory Hoss, principal of DMSAS. Several physical details of the Hoover Dam provided inspiration for the design of the 358,000 square-foot Smith Center, including the elegant massing and articulation of its water intake towers; the care taken with concrete, stone and terrazzo finishes; the incorporation of art, iconography and ornamentation on both the exterior and interior; and the aspiration to create a timeless structure that lasts for many generations beyond its creators. Other key design elements of The Smith Center include the 170-foot tall Carillon tower (with 47 bronze bells) that lends vertical presence and a sense of place evocative of European and early American town squares, an architectural program that promotes a vibrant urban pedestrian environment, and a radical approach to acoustics in the main hall, with the box anterooms used as acoustic dampers: doors on the boxes open automatically when sound absorption and volume control are necessary. Sited at the heart of 61 acres of environmentally remediated and reclaimed rail yards, The Smith Center accommodates multiple venues for a broad range of performance genres and events. 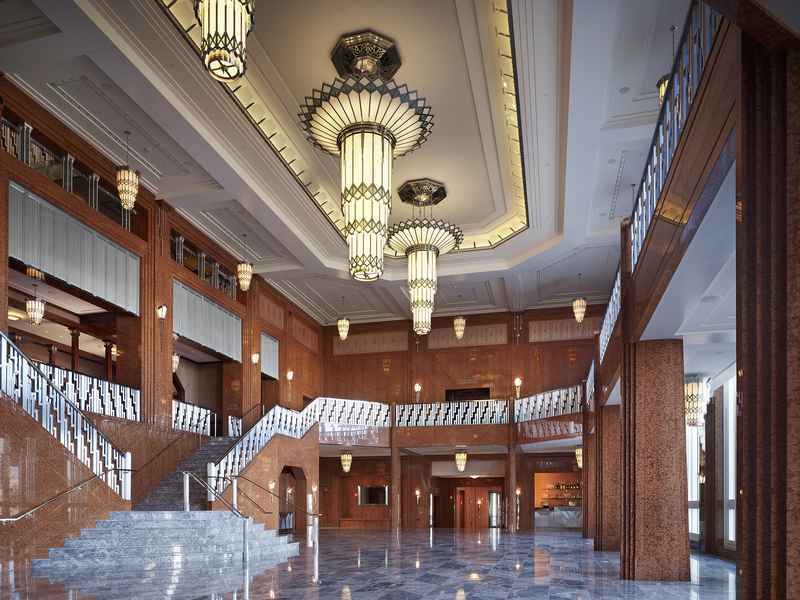 The 2,050-seat Reynolds Hall with its dramatic stage, stunning balconies, and full orchestra pit will host orchestra, opera, dance, Broadway and first-run touring attractions from around the world. The Boman Pavilion is home to more intimate musical and drama settings, including Cabaret Jazz and the Troesh Studio Theater, plus classrooms, offices and ground level retail. The Pavilion overlooks Symphony Park, a 1.7-acre outdoor venue, which will host performances and events, and other entertainment gatherings. Additionally, The Smith Center will be the first major multi-purpose performance center in the U.S. to earn Silver LEED certification. Far from a building alone, this $470 million world-class performing arts center embodies a cultural and community core for the nearly two million people who live in Las Vegas and Southern Nevada, fulfilling a longstanding dream of engaging and uniting the entire community, enabling other organizations to grow artistically and institutionally, and serving as an incubator for new artistic endeavor and excellence. Based in Washington, D.C., DMSAS is best known for award-winning projects that become and serve as beloved civic and cultural attractions. In Las Vegas, The Smith Center for the Performing Arts will bring a local cultural heartbeat to the city and the greater Southwestern region of the U.S. Contextually appropriate and technically innovative, it joins a distinguished DMSAS collection of civic masterpieces that include Schermerhorn Symphony Center in Nashville; American Airlines Center in Dallas; Texas Rangers Stadium in Arlington, TX, the Yale Class of ‘ 54 Environmental Science Center and the Orioles’ Spring Training Facility at Ed Smith Stadium.